From Moa to Dinosaurs, the fifth title in the acclaimed 'explore & discover' series for children, looks back in time to reveal what lived in ancient New Zealand. The book begins with a glimpse of the animals that lived in New Zealand just before people arrived. It then goes back ... read full description below. 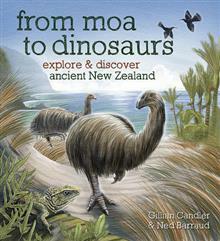 From Moa to Dinosaurs, the fifth title in the acclaimed 'explore & discover' series for children, looks back in time to reveal what lived in ancient New Zealand. The book begins with a glimpse of the animals that lived in New Zealand just before people arrived. It then goes back in time, providing snapshots of particular periods, as far back as 180 million years ago. The range of animals covered in this book is remarkable: moa and other extraordinary birds that are now extinct; crocodilians and turtles; the shark-toothed dolphin and giant penguins; dinosaurs such as sauropods and theropods; as well as those resilient survivors who can still be found in New Zealand today, such as kiwi, native bats, giant weta and tuatara. Beautifully illustrated and impeccably researched, this is a wonderful and intriguing way for children to learn something about the origins of New Zealand. Gillian Candler is an award-winning author who brings her knowledge and skills in education and publishing to her passion for the natural world. She has always been intrigued by how New Zealand must have looked to the very first people who set foot here, and wanted to find out more about what animals lived here then. She found her first fossil when she was 5 years old - an experience she'll never forget - and it opened up a whole new world of interest. Ned Barraud is an illustrator with a keen passion for the natural world. He illustrated the four previous titles in the award-winning 'explore & discover' series, along with his first children's fiction title, Moonman. When not illustrating, he works on films at Weta Digital as a texture artist and enjoys exploring the outdoors with his wife and three children.